There is no outdoor sport more fascinating than pony polo. 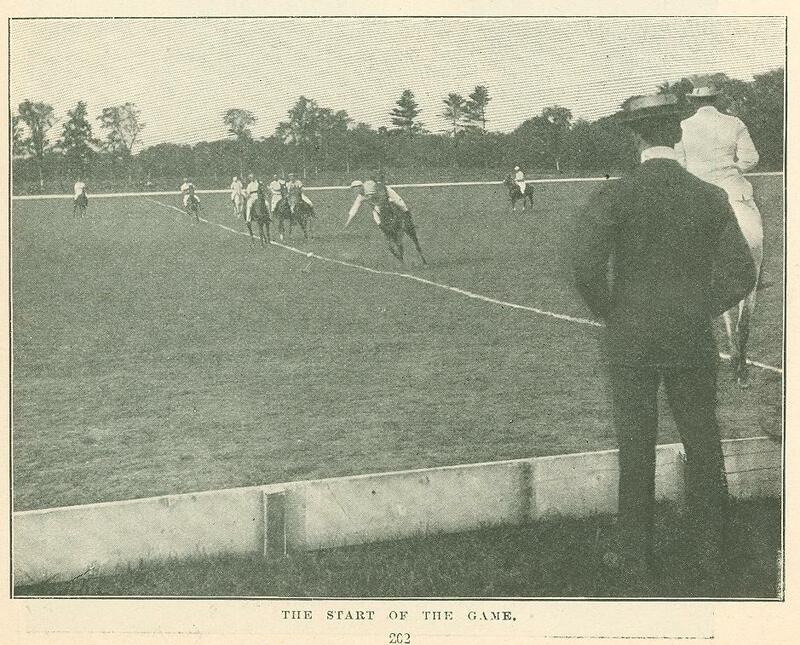 Although this somewhat exclusive game has been estab­lished in America for about twenty-five years, the general public know very little about the sport for the reason that the match games, with one or two exceptions, are played away from the centers of popu­lation, and the people do not have an opportunity to familiarize themselves with the delights of polo. Most of the leading clubs have their grounds located far from the cities, and this is particularly true of the clubs hailing from Boston, Philadelphia and New York. The Myopia club is located some thirty miles from Boston, and the Rockaway and Meadowbrook clubs are almost as far away from Greater New York, while the Philadelphia clubs are also located in the country. 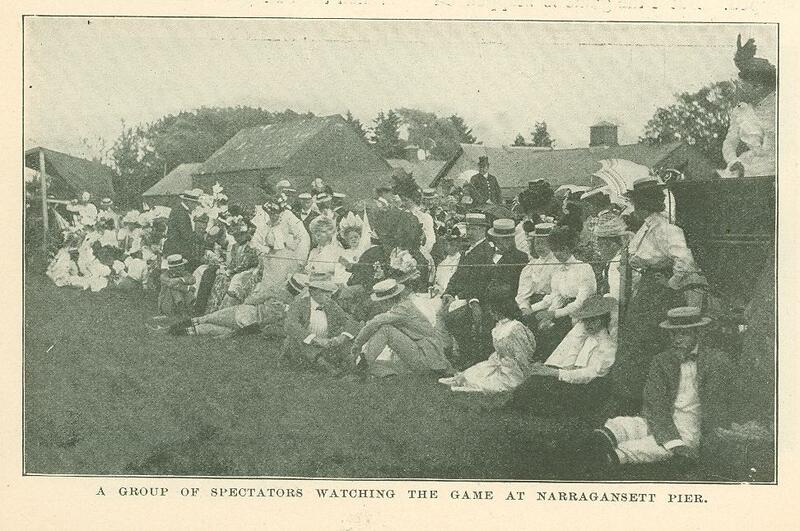 At Buffalo the game is played on a public park, and on polo days large crowds of people assemble to see the fleet-footed ponies race over the turf while their riders attempt to control the ball. Buffalo is perhaps the only large city where the game is played regularly in public, although once every year the national championships are held on Pros­pect Park, Brooklyn, where vast crowds of from 20,000 to 25,000 people turn out to see the crack teams of the country in battle for the Astor gold cup. It will thus be readily seen that the opportunities for becoming acquainted with the game are somewhat meager, and the knowledge of the sport is chiefly confined to the players and their friends who are indi­rectly interested. 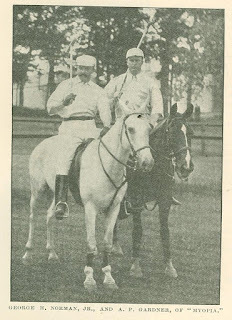 It is with the idea of giving a short description of what a polo game is like that I am writing this article, hoping that it may prove instructive to the thousands of people who have read ac­counts of polo games at home and abroad, but who never have had the pleasure of witnessing an actual contest. The play­ing ground greatly resem­bles in general aspect a football fie1d, with goal posts located at either end of the field. In polo, however, the playing sur­face is larger than in football, as the grounds must be about 750 feet long by 500 feet wide. A white chalk mark clearly defines the center of the field and a ten inch guard fence on either side of the grounds keeps the ball from going out of bounds. The goal posts are located 24 feet apart and are constructed of paper mache so that they will break easily if, collided with. During the entire playing season the grounds receive constant care. The grass is cut and rolled until the entire field is as smooth as a tennis court. The ball used in polo is made of bass wood and is about the size of a cro­quet ball, only far lighter, in weight. The ball is painted white and can easily be seen skimming over the greensward. The mallets for driving the ball are long and slender, with the stick fastened into the center of a cigar shaped end. The mallets vary in length to suit the players. As in other lines of sport, there are officials to govern the game, and in polo a referee, a timer and a scorer are required. 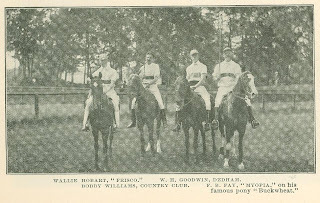 In a match game of polo there are four men on each side, and the players wear the colors of their respective clubs the same as jockeys sport the silk of their racing stables. Every member of a polo team has a distinct duty to perform, and the result of the game depends upon the skill with which a player does his share of the work and takes care of his particular opponent. When all four members of a team work together in unison, the chances of that team for winning are much greater than those of a team whose members try to do things by themselves. The players are numbered "one," "two," "three" and "four," according to their positions. "Number four" is the goal tend, and it is his duty to ward off attacks of the enemy. It is the duty of "number one" to ride off the opposing back, or goal tend, 4itnd make it possible for "number two" or "number three" to score. In a properly played game, "one" and" four" are at either end of a line of battle while "two" and "three" are in the middle of the game, and are on the ball. When all of the players hold their positions the men are seen galloping in pairs, and that is polo. The ball is put in play by being thrown in from the side by the referee, and the men who are lined up opposite one another, immediately make a scramble to get possession of the ball. In a match game the actual time of play is one hour, divided into four periods of fifteen minutes each. After each interval the players and ponies are allowed a rest of seven minutes. When­ever a goal is made or there is a cessa­tion of play from any cause provided by the rules of the game, the time is taken out the same as in football. A score is made by driving the ball through the opponent's goal, and the side scoring the largest number of goals wins the match. The other points in the game are only penalties. A safety is penalized at a quarter of a goal, and a safety is made exactly the same as in football, by having a player take the ball behind his own goal line in order to keep the other side from scoring. In the matter of fouls, the offending side is penalized one-half a goal, and a foul is committed by crossing a player who has right of way on the ball, or by hooking mallets. It is forbidden to touch an adversary, his pony or his mallet with the hand or mallet during play, or to strike the ball when dis­mounted. A player cannot put his stick over his adversary's pony either in front or behind. In riding off or hustling, a player is not allowed to push or strike with his arm or elbow. In case of an accident to a player or pony, or for any other reasonable cause, the referee may stop the game, and the time so lost is not counted. When the game is resumed, the ball is thrown between the players, who are lined up at the point at which the ball stopped. But ii the game is stopped on account of a foul, the ball must be thrown in at the place at which the foul occurred. When the limit of time has expired, the game must continue until the ball goes out of bounds or a goal is made, and such overtime is not counted. In the event of a tie at the end of the last period, the game is continued until one side is credited with a goal or part of a goal. When the ball goes out of bounds at the sides, it must be thrown in from the place at which it went out by the referee, or by an impartial person between the two sides, which are drawn up in line facing each other. When the ball goes out ends, the side defending that goal is entitled to a knock-out from the point at which it crossed the line. When the player having the knock-out causes un­necessary delay, the referee may throw a ball on the field and call play. No opponent can come within fifty feet of a player having the knock-out until the ball has been hit. A player requiring a mallet during a game, must ride to the end or to the side lines to procure one; it must not be brought on the field to him. 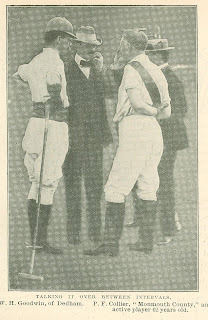 In order to have the players meet in tournament games on even terms, the polo association originated the scheme of' handicapping the members of the differ­ent clubs, and the better the player the larger the handicap. The players are handicapped at so many goals according their respective ability and in a match game, one team is allowed the difference between its aggregate handicap and that of an opposing team. In .the championship matches however; all of the competing teams play without handicaps. One of the most entertaining features of polo is the riding. In order to be a good player, a man must be thoroughly at home in the saddle, and he must have fast, handy ponies. The riding is half of the game, and good ponies, cleverly ridden; have won many a famous contest. The best players generally have a string of half a dozen ponies, and in a match a player will use up at least four ponies. These ponies are remarkably intelligent, and, they go in for the game with as much spirit as their riders. The ponies quickly learn what is required of them, and they take as much delight in riding off an opponent as the men themselves. The ponies are purchased at prices varying from $300 up, and most of them are raised in Texas and. New Mexico. On his native heath, the polo pony is known as a cow pony; and the pick of the cow ponies, used for "cutting" cattle on the big ranches, are picked up by dealers in polo ponies, and they, are educated to the game by cowboys before being shipped, to St Louis, Chicago, Philadelphia, Boston, New York, and other polo centers. It is quite a trick to break the raw cow pony to the game, and among the best types of ponies are those selected from Texas ranches. The game of polo is now firmly established in this country, and the interest in the sport is increasing every year. The present season has been somewhat im­paired by the enlistment of so many polo men with the Rough Riders and other branches of Uncle Sam's service. In England, Ireland and India the game is played at everyone of Her Majesty's army posts. 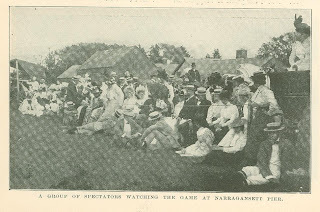 The inter-regimental tournaments are particularly interesting to the military men, and are of equal importance to the tournaments of the exclusive Hurlingham and Ranelagh clubs. The British military authorities encourage polo as a sport, as it is splendid training for the mounted service. United States army officers are in favor of the game, and in a few years it is expected that polo will be adopted by the American cavalry officers. Originally published in The Nickell Magazine. October 1898.